Released memoranda display a deep contrast in the sentencing sought by the defense and prosecution for Dr. Conrad Murray, convicted of manslaughter in the death of superstar Michael Jackson. As expected, defense lawyers will ask for community service and probation during next Tuesday’s sentencing hearing. 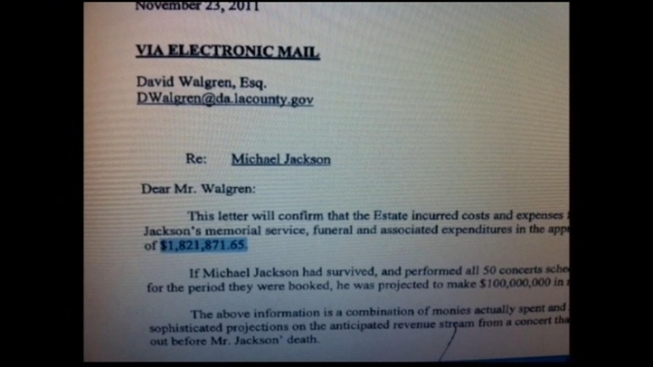 However, the prosecution will seek not only the maximum time of four years, but also restitution of $100 million. How much compensation Murray received for the access he allowed a documentary filmmaker outside court during his trial remains unknown. But comments he made then and during a pre-conviction NBC interview could haunt him at sentencing. “I don’t feel guilty because I didn’t do anything wrong,” a comment made by Murray during the interview, is cited by the prosecution in its memo as a sign of a lack of remorse. “To the extent that he got some notoriety, maybe he got some money, that gives the other side and the judge an opportunity to say, ‘He’s not really showing any remorse, he’s not taking this seriously,’” said NBC4 legal analyst Royal Oakes. The prosecution is seeking restitution on behalf of Jackson’s three children. Included in the amount is $1.8 million for funeral expenses and an estimated $100 million Jackson would have received for 50 comeback concerts. “One purpose of asking for restitution is for the prosecution to send a message to the judge that, ‘If he had the money he’d out to be paying millions.’ He can’t do that, therefore he should be doing the maximum time behind bars,” said Oakes. In contrast, the defense memo portrays Murray as a man who rose from poverty to doctor many patients for free out of the goodness of his heart. The defense memo mentioned current prison overcrowding and the recent realignment of the jails to help reason their request for community service.